Welcome to jacquielawson.com – the classiest ecards on the web! 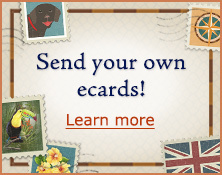 A modest yearly membership fee gives you access to the entire range of online greeting cards and allows you to send as many greetings as you like. You can even get a further discount by joining for two years! We hope you enjoy browsing our animated greetings, and if you're not already a member, we hope you'll consider joining us and sharing Jacquie's delightful animations with your friends and family. And for a special pre-Christmas gift, check out our animated Advent Calendars. Every so often we'll be giving you a more detailed insight into what the team has been up to. Read the latest news now!